FAYETTEVILLE, Ark. – Laura Wasson, a senior in the U of A's Dale Bumpers College of Agricultural, Food and Life Sciences, recently presented research at the national Academy of Nutrition and Dietetics Annual Food and Nutrition Conference and Expo in Washington, D.C.
Wasson, an Honors College student from Little Rock, is a human nutrition and dietetics major in Bumpers College's School of Human Environmental Sciences. 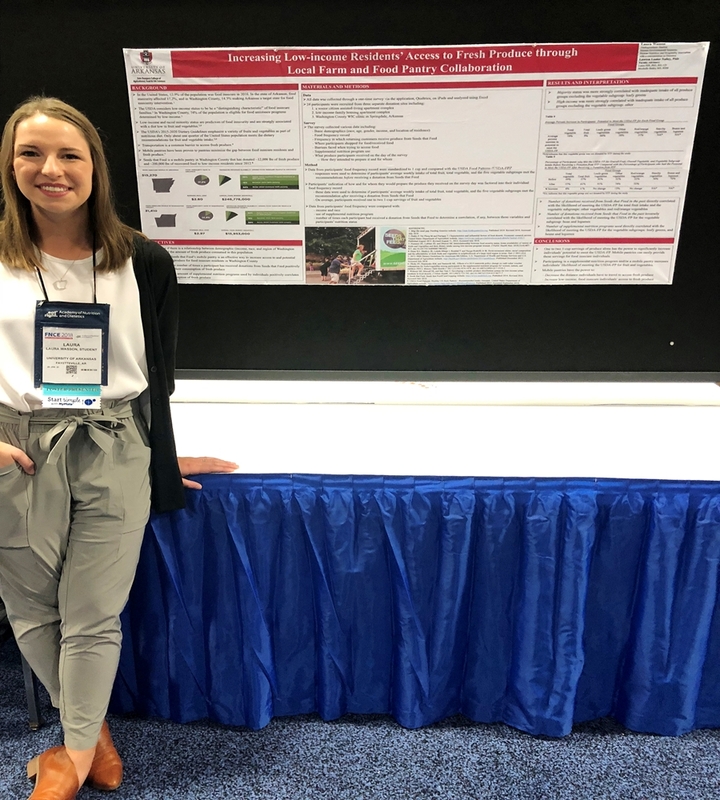 Wasson's presentation, which is also her honors thesis project, was "Increasing Low-Income Residents' Access to Fresh Produce Through Local Farm and Food Pantry Collaboration." "To be surrounded by thousands of people who share the same passion is encouraging because I am reminded that there are plenty of people in this world who will match my efforts and support my passion," said Wasson of attending the conference. "For example, one woman stayed until the end of the conference specifically to talk to me about my research because she wants to implement the same kind of food assistance program in the Denver area. She also said she would happily put in a good word for me at one the internships I am looking into. FNCE is a giant networking event where you can count everyone you talk to being equally as passionate and engaged as you are." Wasson's faculty committee includes human nutrition instructor Laura Hill, who is her adviser; Mechelle Bailey, clinical instructor and director of the Didactic Program in Dietetics; and professor Lanier Nalley from the Department of Agricultural Economics and Agribusiness. Wasson's trip was supported in part by winning the first-ever Design Solution Challenge sponsored by the Sam M. Walton College of Business. The challenge was a semester-long social entrepreneurship competition sponsored by the Social Innovation Hub and the Office of Entrepreneurship and Innovation in Walton College. She received funding to attend and present her work at the conference of her choice. In the competition, Wasson addressed a need identified by Fayetteville-based hunger relief organization Seeds That Feed, which collects surplus fresh produce from area farmers and distributes it to hunger relief outlets in low-income areas, improving food access and reducing waste. The organization's core challenge is maintaining financial solvency while continuing to improve the efficiency of their operations. "My project followed Seeds That Feed, which receives produce donations from the NWA Farmers' Market Farmers," said Wasson. "They then distribute among low income housing complexes in NWA. Many of these residents are or are at-risk of food insecurity and poor nutrition. I analyzed the diet of their customers before and after receiving a donation from STF and found that STF's donations increase their access to fresh produce and increases their ability to meet the USDA Food Patterns." The Academy of Nutrition and Dietetics is the world's largest organization of food and nutrition professionals. The academy has over 100,000 credentialed practitioners — registered dietitian nutritionists, dietetic technicians, registered and other dietetics professionals holding undergraduate and advanced degrees in nutrition and dietetics, and students — and is committed to improving the nation's health and advancing the profession of dietetics through research, education and advocacy.